The owners of Magan very kindly invited my family and I to enjoy a meal at their newly opened Indian restaurant at The Dining in Abu Hasaniya over the weekend. A really lovely young couple, I enjoyed meeting and talking with them. 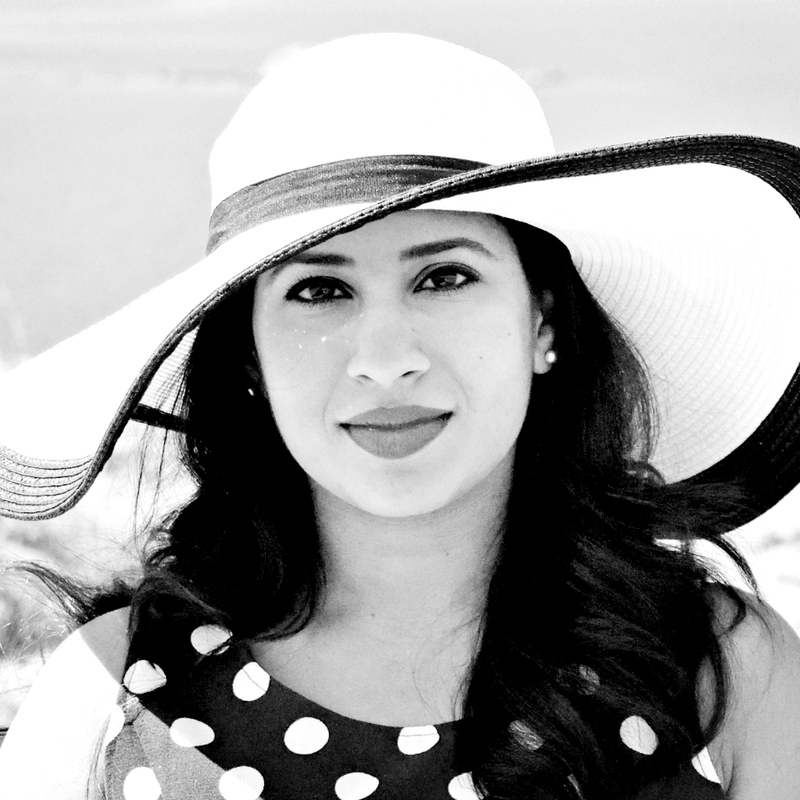 The inspiration behind opening the place was a well enjoyed holiday to Goa, where on falling in love with the food, they came back wanting to do something here in Kuwait. The idea developed into a restaurant and the next couple of months were spent putting together a strong team and an even stronger menu. I love that and I think it shows real passion when you work hard to make a dream/idea into a reality. On stepping into the restaurant, you're taken away with just how beautiful it is. Sleek, modern and tastefully done. Everything is black and gold, the plates, cutlery, cushions, tables, seating and even the switches and dimmers, now that is attention to detail! There are about nine tables inside and a seating area outside as well which is perfect during these cooler months. They even have live band nights as well which sounds lovely! The staff, also dressed in black and gold, were friendly and well trained. After settling down, we were presented with the menu along with a tablet. You know how I love pictures and I immediately appreciated the fact that the tablet contained photos of every single dish on the menu! I love not having to imagine what a dish looks like based on the description. The menu had been well formulated, there was a nice variety offered and there were so many dishes I wanted to try out. 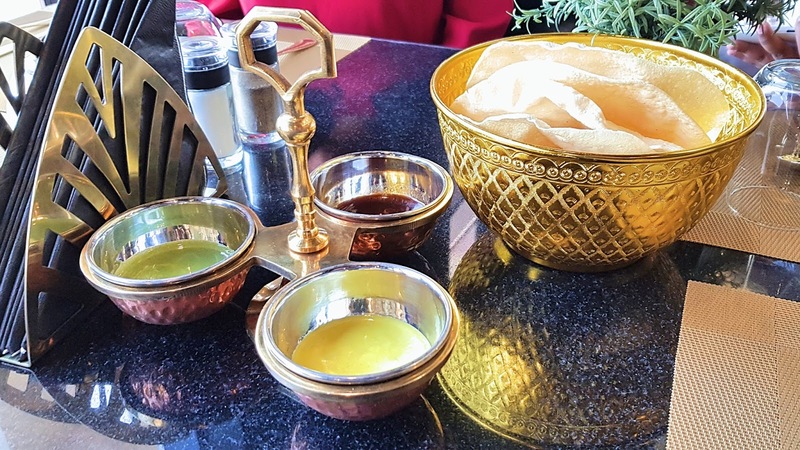 We were first offered a bowl of pappadums and three chutneys: mint, tamarind and orange. The orange immediately caught my attention because it was something out of the ordinary. It had a very delicate ginger undertone to it which I loved. The mint chutney had a subtle hint of heat which again I loved, most mint chutneys don't have any chili incorporated into it so this was a little different. The tamarind was pretty standard, but still nice all the same. 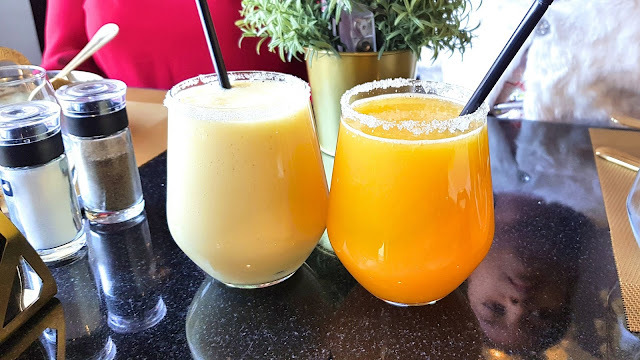 For drinks, we ordered an orange juice (KD 1.500) and a mango lassi (KD 1.950). The juice had been freshly squeezed and the lassi was thick, creamy and delicious. You really can't go wrong with either and they were both really great. 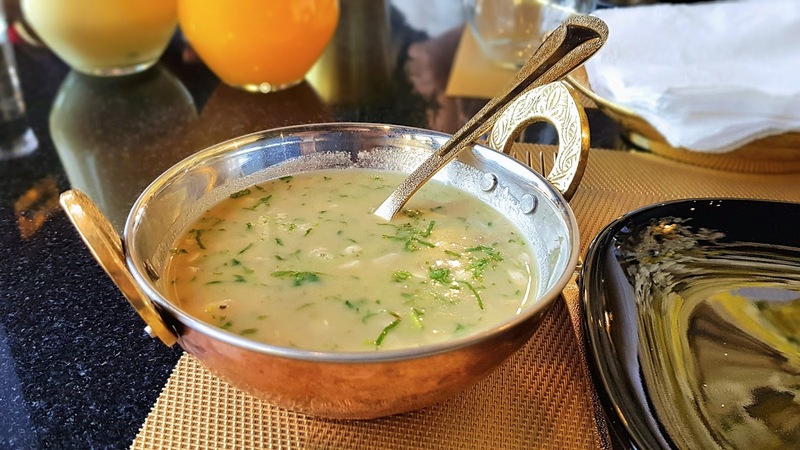 I wanted to try one of their soups and my eye immediately fell on the Mutton Bone Rasam (KD 2.250). Slow cooked lamb broth with a mixture of vegetable aroma, said the menu. Now rasam is traditionally a tomato based (vegetarian) curry that has a lot of spices. I'm talking about the type that makes your eyes water and nose run, perfect for when you're sick. This really intrigued me, mainly because of the mutton, and I had to try it. It was served in small copper bowls and it immediately warmed me from the first spoonful. It has this beautiful mutton flavour infused throughout and was deliciously creamy. There was a hint of spice, but it wasn't overpowering, a safe one for the kids. I should add that though normally I order everything spicy whenever I dine at an Indian restaurant, we specifically asked for all dishes to be made "regular" so that we could judge the food for itself. For starters we decided on the Crispy Lamb Kola Urundai (KD 2.750). 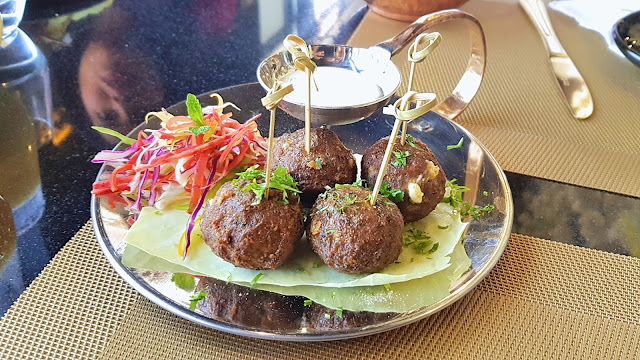 An Indian take on meat balls with minced lamb, Indian spices and an optional cheese filling should you want to add it. There was a beautiful aroma of spices and the balls were served hot, juicy and moist. A tad salty for us, but a delight nevertheless when combined with the creamy yoghurt dipping sauce that they served with it. Now, our waiter insisted that we add the Mushroom Kebabs (KD 1.750) to our order. Normally I tend to stay away from veg dishes and I listened on skeptically as he described the dish. We decided to be good sports though and ordered it and oh boy, it was the dish of the day for us! 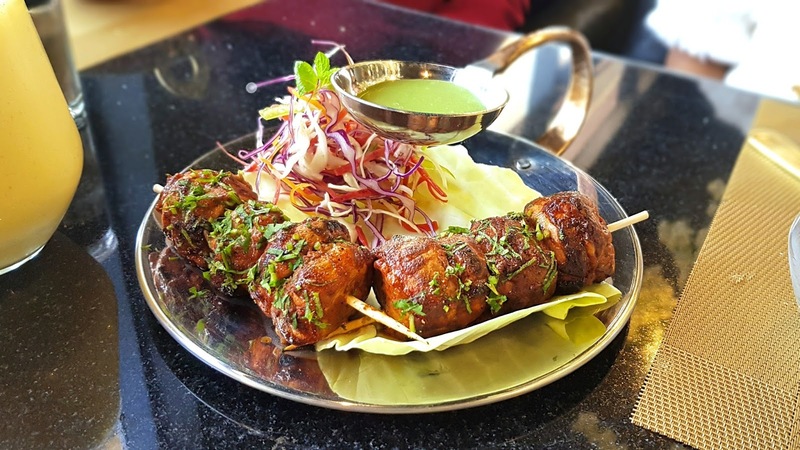 The menu described the dish as skewered mushrooms marinated in kebab spices and finished off with a touch of smoked paprika and coriander leaves. The underlying mushrooms were juicy and the masala that encapsulated the mushrooms was just amazing. Each mouthful was a treat for the taste buds and I've been recommending this dish to anyone who lent me an ear over the past few days. A definite must try! 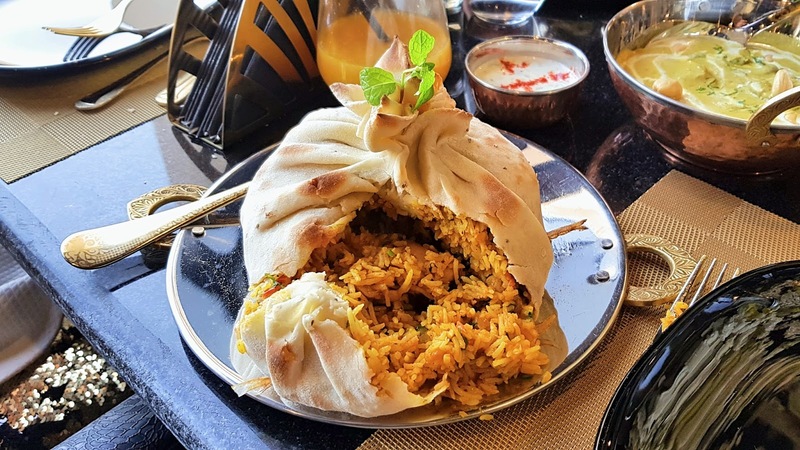 For our main course, we wanted to try a rice dish and chose the Hyderabad Dum Biryani (KD 3.250 to KD 4.250), specifically the chicken dum biryani. I loved the presentation of the biryani. I've normally seen pots sealed with dough allowing the rice and meat to slow cook, while still retaining moisture. But having the entire dish encased with the dough was new to me and certainly added to the drama of the dish, especially when our waiter cut through to reveal the steaming biryani inside. The chicken, though a little overcooked, the biryani on a whole was flavourful and aromatic. Absolutely loved it, a definite winner. We also ordered the Mutton Shahi Korma (KD 4.950) to go with the biryani. I had my eye on the Chicken Masala, but as the biryani was also chicken, we thought we'd order another protein. 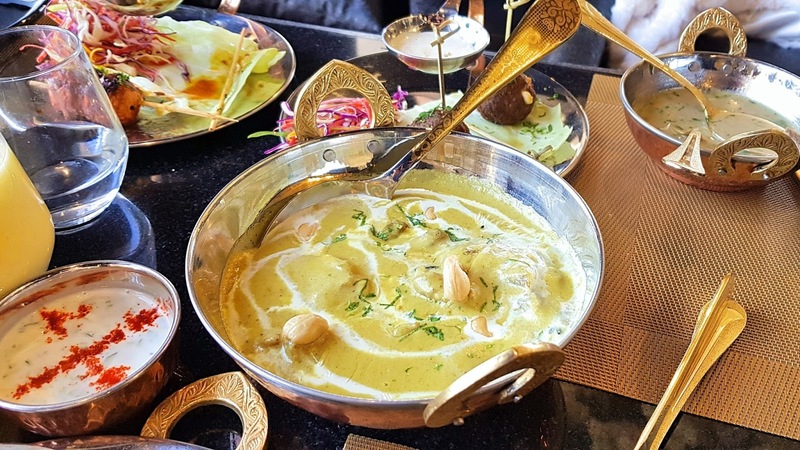 The korma was rich, creamy and had a slight sweetness to it. It probably wasn't the best choice to go with the biryani and on hindsight, it would've gone down better with a naan or two, but still a great dish! For dessert, we just had to order the Gulab Jamun (KD 1.950). We were asked if we would like it to be served hot or cold (isn't it great when you're given a choice like that?). There's nothing better than cold gulab jamun and that's the way we asked for it. 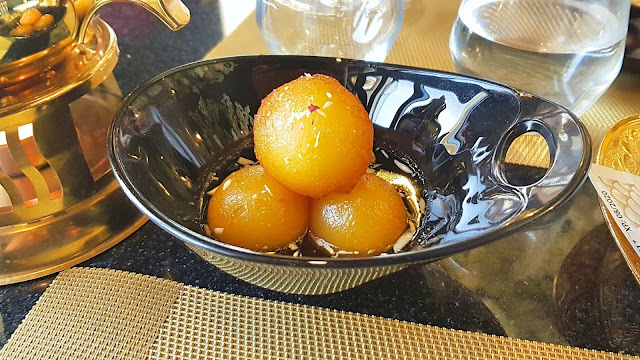 Small, melt in the mouth, gulab jamun immersed in a saffron infused sugar syrup. 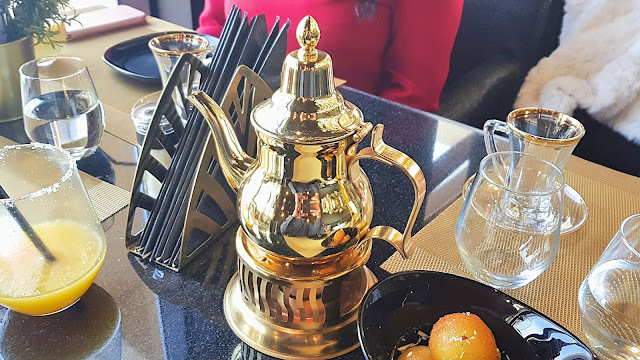 To end it all, we ordered a very generously sized pot of Masala Chai (KD 1.500). Nothing hits the spot like perfectly spiced sweet milky tea. The perfect way to end our meal. 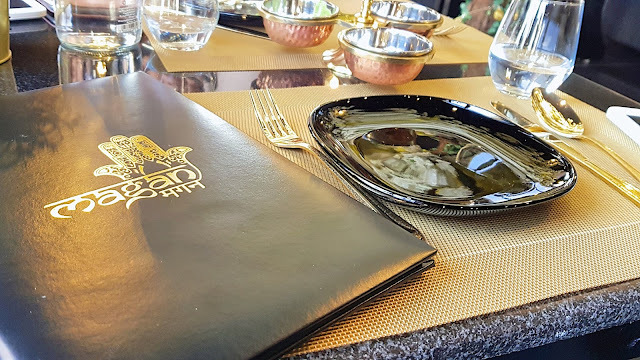 Overall it was a great dining experience with the highlight of our meal being the mushroom kebabs and the biryani, a close second. 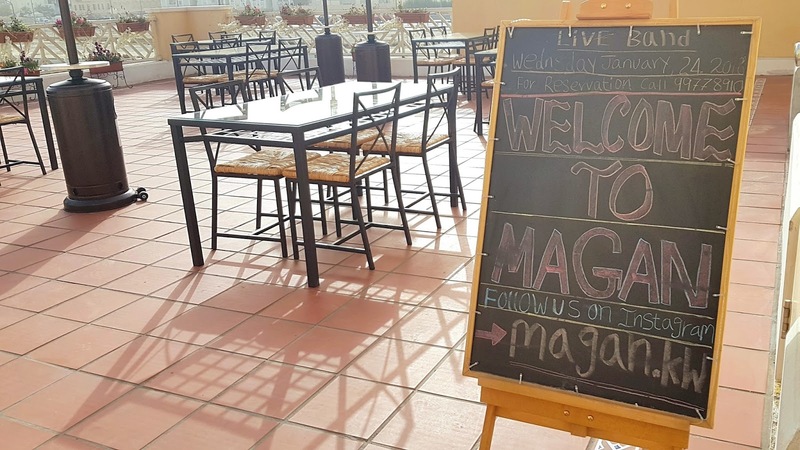 Magan is located in The Dining in Abu Hasaniya (take the lift to the first floor). They're still in their soft opening phase, but diners are more than welcome to stop by and enjoy the wide range of Indian food. Call on 99778910 for reservations and catch one of the live music nights. They're also on Instagram here @magan.kw. 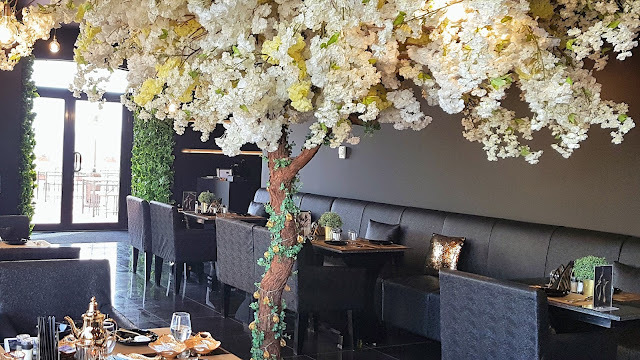 Beautiful restaurant, excellent staff and great food, what's not to love!? Hey Sonia! Oh you definitely need to try this place! Beautiful restaurant, good food and very fair prices. Don't forget to try the mushroom kebabs! Any idea when are the live band nights? Hi Alejandro! There's a live band night this Wednesday (January 31). Give them a call on 99778910 to know exactly what time it might start. They advertise their band nights on their Instagram page so keep checking. Are you planning on visiting? Would love to hear about your visit.